Yacht Consultants Asia (HK) Ltd. offers professional Representation to the entire Yachting Community regardless of your existing location. Full or part time representation will depend on your needs, but whether its finding a responsible builder for your one off yacht or starting a new Marine related enterprise, we are able to offer ironclad representation to you or your company at a fraction of the cost of you being here. Our Team can physically work on a full time basis or visit your cooperative partners/ manufacturers as required by the project. Our experience in Yacht construction and production allows us to understand your thinking as well as your product... our familiarity with Western and Asian production environments, allows us to identify and report real time activities. 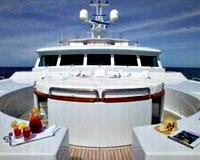 As Manufacturer's Agents to international Yacht savvy markets. At Domestic and International Boat Shows, Exhibitions and Trade Shows. To provide high quality yacht interiors... designed, built and shipped exactly to your specification. To provide conversational, technical and legal translation. To open communication to international Marine related manufacturers. When approaching local, provincial or federal governments regarding future interaction, business start up etc. When finding business opportunities or cooperative partners. When full or part time, On Site and / or Virtual Office Representation is in your best interest. To assist in safeguarding your interests. When you require Marine Surveys. To collaborate closely with Classification Societies, and Tank testing facilities.